Palmer Physical Laboratory, Princeton, N. J. 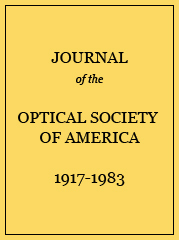 Critical frequency measurements for the light adapted anomalous trichromatic eye were made on spectra of fourteen intensities. No Purkinje effect was observed. The Ferry-Porter law is apparently obeyed but the branches of the Porter graphs are more numerous than for normal vision. The results are interpreted by Allen’s visual reflex theory. Critical frequency measurements at points from the fovea toward the temporal periphery for three wave lengths in the yellow fall on three distinct curves. The ends of the first two probably mark the boundary of the fovea and the macula lutea respectively. One peripheral normal curve is given.